With the rising popularity of the stainless steel refrigerator, fridge doors cluttered with magnets, notes and drawings are becoming a thing of the past. However, you can still display your family's accomplishments and keepsakes on your fridge door and other non-magnetic surfaces within your home by using handy new self-adhesive products and useful magnetic boards. 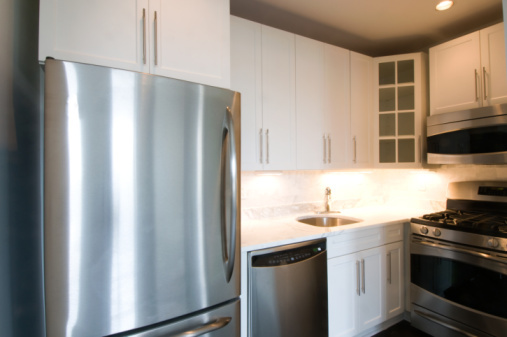 Stainless steel appliances do not offer the convenience of a magnetic surface. Visit your local home improvement store to stock up on double-stick tape to help show-off your lightweight items like drawings, business cards and birthday party invitations. Double-stick tape is an easy way to adhere your paper items but may not have the power to hold heftier items. Consider purchasing self-adhesive products such as hooks and organizational caddies from 3M's Command line to help organize any clutter, hang car keys, and store pens, pencils, paper clips and more. Organize your favorite photos and print them on self-adhesive photo paper (such as Epson A4 Self-Adhesive Photo Paper, available online for less than $15.00 as of June 2011.) Photo paper will stick to metal, wood and other non-magnetic surfaces - allowing you to showcase family photos as well as create and post labels, signs and stickers. Install a magnetic board to your refrigerator held by strong suction cups. This is the easiest way to replicate the convenience of a magnetic door fridge. A magnetic board known as the 'Choopa Board' can be found online in two sizes with a stainless steel finish. The 'Choopa Board' is not recommended for use with GE Profile, GE Monogram, and Thermodore stainless steel appliances, but works well with other stainless steel appliances as well as on glass, granite and most flat, nonporous surfaces. Based in Boston, Kelsey Readyhough is a copywriter for a members-only private sale website. She holds a Bachelor of Arts in international studies from University of Richmond.